Gingham ribbon wired edge considered as the best fabric that adds a real flair to your functions. At BB Crafts, we have a premium quality of gingham ribbon wired edge, the stylish fabric famous for its quality, which made of 100% polyester. This ribbon measures in the size of Width: 1-1/2 inch and Length: 10 yards. Gingham design looks great and trendy on clothes, and now it comes with a ribbon. This premium quality ribbon is perfect for hair and tie bows, showers and much more. It can be used whenever a traditional plus bright look required and available in wholesale price also. The texture and its available colors like red, pink, blue make your special occasions grand and delightful at the reasonable price. 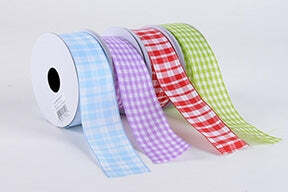 It is an attractive check ribbon that is of high quality, making it easily washable. It's wired edge quality can be used in wrapping gifts and party backdrop decorations. If you want to make your event or wedding function memorable, then donâ€™t forget to take the advice of the professional experts. With our Wired Gingham Ribbons, you will add a sense of vigor, care, to your most important occasions.